A socket is defined to be the unique identification to or from which information is transmitted in the network. A network socket is an unique identifier of a network connection between a server (local machine) and a client (remote machine). This connection is implemented by a software (not hardware) by creating a network interface. A socket is therefore an endpoint of an inter-process communication flow across a computer network. Today, most communication between computers is based on the Internet Protocol; therefore most network sockets are Internet sockets (ie TCP socket). Unix domain sockets (UDS), for internal inter-process communication. A UDP socket cannot be in an established state, since UDP is connectionless. 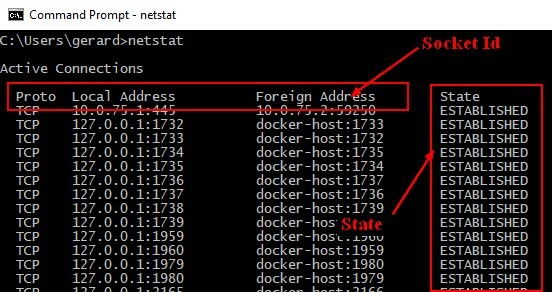 Therefore, netstat does not show the state of a UDP socket. The operating system forwards the payload of incoming IP packets to the corresponding application by extracting the socket address information from the IP and transport protocol headers and stripping the headers from the application data. port is the listening port. Java: For IPC, you could also use ObjectOutputStream and ObjectInputStream connected to network sockets and exchange Java objects directly between the two programs. Or you could design your own protocol.